Should you buy precious metals in physical form? Or is some sort of bullion ETF sufficient? This article examines the pros and cons of buying and holding physical gold and silver. We’ll also look at the #1 advantage of having physical metals at your disposal. Like most things in life, physical metals have both advantages and drawbacks. While it’s no secret that we at GoldSilver believe in the merit of physical metals investments, let’s start with an objective look at their drawbacks. Like virtually any investment you buy, gold and silver purchases incur a commission. And those commissions are usually higher than you would pay to buy a stock or bond (though they are generally lower than associated real estate costs). Online dealers are usually less expensive than your local coin shop, even with shipping fees, and may have a greater selection. Many online dealers waive shipping and insurance charges (usually billed as one fee) with a minimum purchase. Most dealers also provide volume discounts. If you buy 20 or more one-ounce Eagles, the premium drops to $58 per ounce, or 4.5%, for this dealer. A one-ounce gold bar is currently $41 over spot, about 3.2% over spot. If you buy 25 ounces or more, the premium is $33, or 2.5%, per ounce. Buying a stock with an online broker is usually less expensive, with many offering commissions less than $10 per transaction (though it could be a high percentage of your investment if you buy a small amount). A full-service broker is considerably more, and depending on the amount of your investment could rival costs for bullion. Real estate commissions average 5-6% in the US (you pay closing costs as a buyer, the commission as a seller). To be clear, these are premiums on bullion. Premiums on a rare coin or a numismatic product are considerably higher since these are collectibles. Unless you want to become a collector, it’s best to avoid these products, partly due to the excessive premiums. Overall, while it costs more to buy bullion than other investments, premiums are not excessive. Industry margins are low, so premiums are not likely to come down much further (and could rise if the market gets tight). When you buy physical metal, you’ll need to store it somewhere. You don’t have to worry about “storage” with a stock or bond (unless you decide to take delivery of certificates). Bullion storage costs a fee you have someone else store it for you, and you risk theft or loss if you store it at home. Using a storage facility or a safe deposit box at a bank involves an ongoing fee. However, if you buy a bullion-backed ETF, you also pay an ongoing commission, which is used in part to pay for storage. You don’t get a bill as you do from your bank or storage facility, but you’re charged just the same. That fee is usually not onerous; GLD, the largest bullion ETF, currently charges 0.40% annually. But it’s not just the fee you have to consider. The security of the metal and the safety of you and your loved ones should be part of the decision process, too. If you keep all your bullion in the house, you could lose it in a robbery… or fire… or natural disaster. A home safe is not foolproof, either; they only buy you time, since most can be broken into sooner or later, or a thief could demand you open it – while holding a knife to your sweetie’s head like happened to a friend of my father. A safe deposit box at the bank gets it out of the house, but it introduces other problems. First, the contents of bank boxes are not insured; FDIC insurance only covers bank deposits, not box deposits. Second, if you need your bullion in a hurry but the bank is closed for the weekend or a holiday or some sort of banking emergency (several banks were closed during 9/11, for example), you’re out of luck. Last, one of the advantages of owning physical metal is that it’s outside of the banking system – but using a bank box leaves it exposed to that system. Keeping some bullion close at hand is wise. One of its greatest strengths is that it can be used in an emergency. So having immediate access to at least some of your stash provides that utility if you ever need it. But for ultimate safety and security, nothing beats private, professional storage. It’s outside the banking system and gets it out of the house. It’s also insured. And there are some very reputable programs now that are very cost-effective – this one’s monthly cost starts at less than the price of a Starbucks Frappuccino. If you hold physical metal, it might not be immediately liquid. While some states have passed laws making gold and silver legal tender, you still can’t buy groceries or a new car with gold coins or silver bars. You first have to convert to currency (unless you use them for barter, which could be feasible in some circumstances). There’s one way around this liquidity drawback: online storage. With an online storage account, you can sell your gold or silver at any time (during trading hours), just like a stock. This gives you near-instant liquidity, as funds are dispersed after settlement, usually within 2 business days, also just like a stock. Bullion ETFs provide the same liquidity, though they have their own set of risks. Check out the key structural defect they all carry in this article. Believe it or not, gold and silver bullion are recognized by the IRS as “collectibles.” This means you pay a maximum 28% capital gains tax if the metal is held for over one year. Taxes on long-term capital gains such as stocks, on the other hand, are lower for most investors (the highest rate is currently 20%). You can get a lot of good information on tax treatment – including what is reported and what is not – here. Last, one of the knocks on owning any form of gold or silver is that they don’t pay interest or dividends. Some stocks and bonds, on the other hand, do. Real estate can provide rental income. But this argument is flawed. Gold’s purpose is not to produce income; its function is as money and a store of value. The dollar bills in your wallet don’t produce income, either – until you buy an interest-bearing bond or dividend-paying stock. Gold is not a currency at this time in history, but its most prevalent historical use has been as money, and that includes today. This is not a reason to avoid buying physical metals. There are a number of advantages to buying physical metals, some of which you can’t get with almost any other kind of investment. See if any of these benefits would be useful to you. How many investments can you hold in your hand? Physical metals can’t be destroyed by fire, water, or even time (silver does require occasional care). And physical metals are unlike commodities because they don't need feeding, fertilizer, or maintenance. 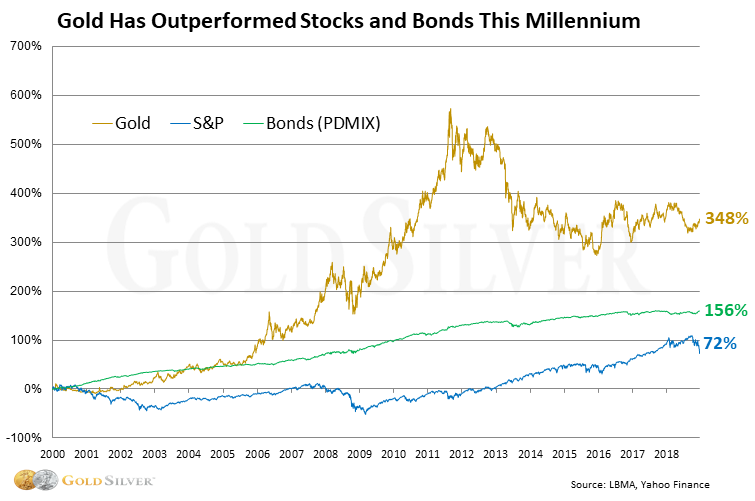 Many mainstream advisors claim stocks outperform gold. But that’s not actually accurate. While precious metals are usually thought of as a defensive asset, this shows you can actually earn a profit on them. That’s because gold is inversely correlated to traditional asset classes. When investors become risk-averse or are uncertain about the future of the economy or markets, gold is sought out and thus tends to do well when other assets don’t. This makes gold an excellent diversification tool for an investment portfolio. How much of your wealth is in digital form today? If your online world comes crashing down, or even if you’d just like some diversification away from the web, physical metals can provide that. A Gold Eagle in your hand doesn’t rely on electricity or the internet, can’t be hacked or erased, and can be exposed to the elements without suffering damage. Try that with your cellphone. This is especially true with gold. You can hold $50,000 of gold coins in the palm of your hand. They actually take up less space than a stack of dollar bills of equal value. This means you can store physical gold in a relatively small space. How many assets can you say that about in today’s world? If you want a little privacy or confidentiality, physical metals are one of the very few investable assets that can offer this. If you don’t know how to spot a real diamond, aren’t familiar with the painter Van Gogh, or don’t collect comic books, just buy some physical metals. You don’t need any special skills or training to purchase bullion. You can take physical metals with you literally anywhere in the world. This is naturally easier with gold than silver, but if you need some traveling money or wish to store some metal in another country, you can do that with physical metals. You can even make crossing borders easier with this form of gold. Because they hold their value over time, and because they’re tangible assets, physical metals can be a perfect asset to pass on to your heirs. There are many pros to owning physical metals, but this is probably the greatest. Physical metals are no one else’s liability. If you hold real metal, there is no paper contract to make you whole, no middleman you need to make good on what someone else owes. Gold and silver are the only financial assets that are not simultaneously some other entity’s liability. They don’t require the backing of any bank or government. This further means that gold and silver won’t go to zero. It’s never happened in their 3,000+ year history of human usage. That’s a powerful feature, especially if you talk to former shareholders of companies like Bear Stearns, Enron, or Lehman Brothers. Physical metals can’t go bankrupt or broke. Bullion will never default and is not subject to promises or obligations.